The auxiliary gym swarmed with students, staff and parents on Sunday, Oct. 14. Volunteers wore yellow shirts, hairnets, aprons and plastic gloves. 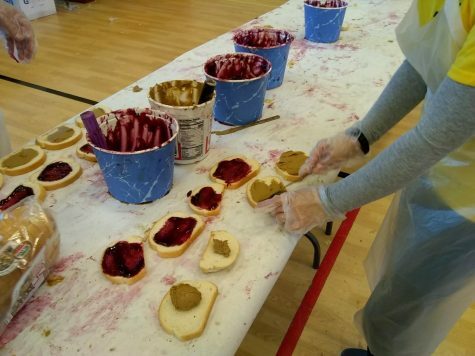 They worked in teams at rows of tables where they diligently lined bread slices in long paired lines, spread Sunbutter on one side, jelly on the other, then closed the sandwiches and stacked them for bagging and transport to the sandwich chain in the main gym. Junior Lena Leland and Student Activities Coordinator Craig Alexander organized the Herd Against Hunger to benefit the 21% of people in Northeast Ohio who live in food insecure households. Superintendent Dr. Bob Hardis, Principal Tony Srithai, former district communications director Shana Wallenstein, facilities and grounds supervisor Brian Koss as well as Lucy DuHaime and Jennifer Currey from AVI food systems were also instrumental in planning the event. Leland worked hard to make it happen, emailing every school in Ohio and posting about it on social media. The gyms were crowded with 425 people coming and going throughout the day, all contributing as they could. The event was planned to run from 8 a.m. to 8 p.m., but it continued past midnight. 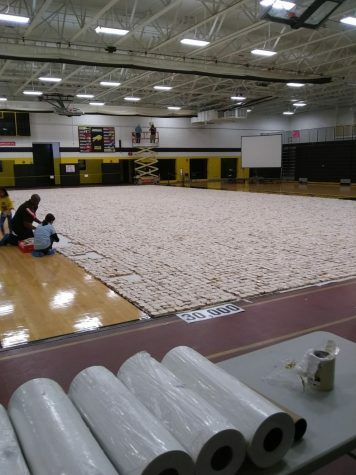 Besides feeding the hungry, the goal of the event was to break the world record for longest continuous sandwich chain and to make 40,000 sandwiches. 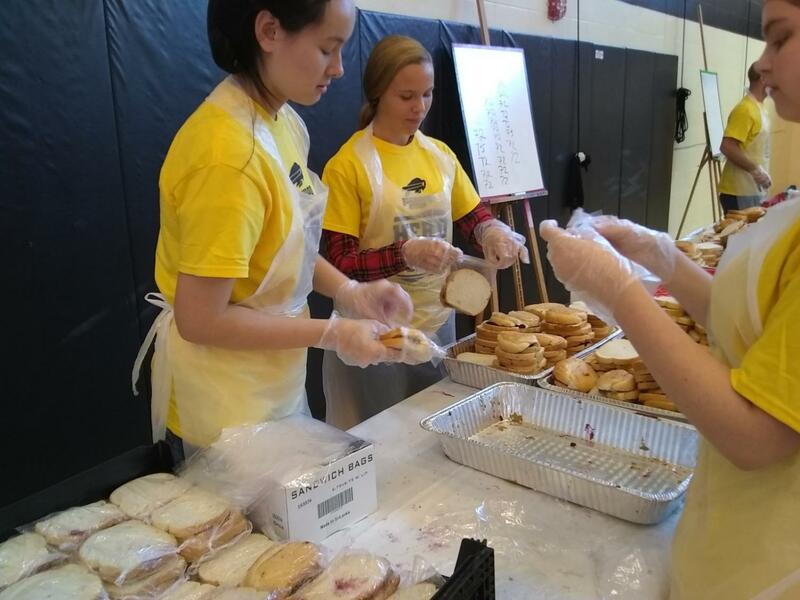 While volunteers were able to break the world record, they were only able to make 32,300 sandwiches- still enough to make a big difference. Official surveyors from Gutosky & Associates, Inc. checked the gym and confirmed that the record had been broken. The Sunbutter and jelly sandwiches were made in the auxiliary gym and lined up in the big gym. The line spanned approximately 2.5 miles or 13,300 feet. After packing, they were delivered on Monday to local soup kitchens and shelters. Sunbutter donated the Sunbutter and sunglasses, Welch’s donated the jelly, Orlando Baking Company donated the bread and AVI Foodsystems, which runs the school cafeteria, donated materials such as scoopers and hairnets. “[The atmosphere was] very intense, but a good type of intense because we were all working towards the same goal,” junior Joe Spero said. The impact of the event went beyond Beachwood. The Herd Against Hunger PR team reported a total of 175 million views on articles and broadcasts about the event. Alexander said Beachwood has never done anything like this. The school intends to make Herd Against Hunger an annual event to combat the hunger problem in Ohio. “While it’s true that one sandwich only solves one person’s hunger for a short time, the purpose of this event is to raise awareness toward figuring out a way that we can help fight this huge problem,” Leland explained. Leland understands that hunger is not the only issue facing people in Ohio. Junior Jordyn Zawatsky, a member of the Herd Against Hunger leadership team, was inspired by the event. Many volunteers described the atmosphere as light and fun even as they worked hard. “I loved how it felt like you were just hanging out with your friends and listening to music while making such a huge impact,” sophomore Ruby Cheistwer said. Leland encourages others to make a difference and fight hunger in their everyday lives. Leland worked on the event for months, but she believes it was worth it.